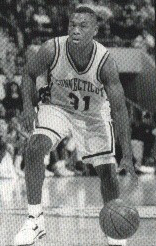 Brian Fair was a Guard for the UConn Huskies from 1991 – 1995. He’s a member of the UConn Basketball All Century Ballot, he’s No. 2 in career three-point field goal shooting and No. 10 in career games played, at 125. Brian has just been named the Head Coach for the Varsity Basketball Team at his Alma Mater, South Mountain High School, in Phoenix Arizona. I had the opportunity to talk to Brian by telephone from Phoenix in April 2004 as he reflected on his childhood as an athlete, his time at UConn and he shared some post-collegiate experiences. It wasn’t until Brian was in the 6th or 7th grade that he started to watch basketball. He started watching the Big East on ESPN’s Big Monday. His favorite team was the Syracuse Orangemen and his favorite player of all time is still Pearl Washington, a guard from Syracuse University. Brian wears #31 on his jersey, after Pearl. Prior to that, football was Brian and his family’s sport. Brian had an uncle who played professional football for 10 years with the Green Bay Packers from 1968 – 1978 and his little brother Terry is going into his 6th year playing for the Pittsburgh Steelers. Brian was a chubby kid until the summer following junior high school when he grew from 5’8” to 6’2” and stretched out. He started to concentrate on basketball, not more than football though. In his first year of high school he was picked for the Varsity football team as a quarterback as well as a guard on the Varsity basketball team. Brian was one of few people at his high school that played four years Varsity football and basketball. Brian still holds the scoring record for basketball with just under 2,000 points at South Mountain High School. The highlight of his high school basketball career was during his senior year when the team record was 32 wins and 0 losses, they won the State Championship and Brian was named Player of the Year along with being named on a couple of All American Teams. “Nothing in the world could have prepared me for what was in store in Connecticut,” he said. The coaches instilled in the players that they needed to go out and compete every night. Winning wasn’t talked about much, but competing and willingness to win were. Brian felt the coaching staff at UConn, Coach Jim Calhoun and his staff at the time, Dave Laitao, Howie Dickenman and Glen Miller, were the best group to give him the type of coaching that he needed to be successful in the league. Brian’s freshman year was tough, being so far from home, trying to find himself, but Connecticut’s friendly people and basketball atmosphere welcomed Brian into their arms as one of their own and made it a very easy transition. Brian was almost 3,000 miles from home but his mom was able to come to Connecticut about two times per year, made it to games that were close to Phoenix, and had a satellite dish to watch her son on TV for any games she couldn’t attend. Brian said that in being on the UConn basketball team, kids learn so much, particularly how to be accountable for their actions which contributes to the rest of your life. He said that is a tribute to Coach Calhoun and the staff he has in place. Brian celebrated his third wedding anniversary in April with his wife, Maisha, and he has three children: a son Mario is 8 and doesn’t care for basketball much but goes to the park with his dad to practice shooting, a daughter Raelynn, age 3, who Brian thinks might be a track star because she can go around the track three or four times without stopping, and a new born Brian Jr. who is five months old. There is a UConn Alumni game this summer and Brian said he is 90% sure he’ll be able to come to Connecticut to be a part of it.